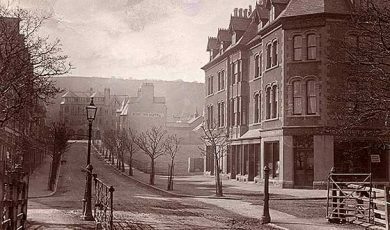 In the early 19th century the area of what is now Colwyn Bay, from Nant y Glyn Road in the east to the West End to the west, and southwards to the edge of the built up area on Llanrwst Road, was part of the Pwllycrochan estate. The land was largely agricultural with a few farm buildings. The name Pwllycrochan means Cauldron pool, reflecting the stream which flows down the adjacent Dingle and passes the house of the same name. The first mansion called Pwllycrochan was probably built in the late 17th century by Robert Conway, who had acquired the land in about 1680. It was originally a smallish brick mansion. The current property is the successor of several mansions of the same name, in which have dwelt several generations of local squires. The land subsequently passed to the ownership of the Williams family and in 1808 was inherited by Jane Silence Williams. 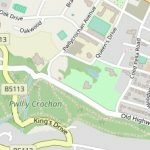 In 1821 she married Sir David Erskine of Cambo, Fifeshire and they decided to make Pwllycrochan their home, demolishing and replacing the existing house. 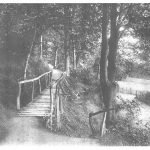 Acres of land, hitherto fields, were planted with trees and additions were made to the woods, in which were made paths and rustic bridges. Small fields were combined to form parkland either side of the private drive (now Pwllycrochan Avenue) which led to the turnpike at the foot of the hill – now Abergele/Conway Roads. After Sir David died in 1841, his widow continued to live there with her six children. However Lady Jane and her son, the new Sir Thomas, in turn demolished the house and replaced it with what is part of the present property. 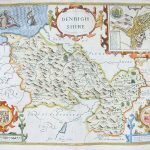 In 1865, as Sir Thomas found that he needed to spend more time on his Scottish properties, he decided to sell his Welsh properties. 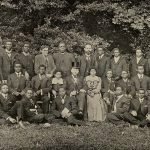 Pwllycrochan mansion, its gardens and farm buildings and 700 surrounding acres of land were purchased for £26,000 by John Pender, a Manchester businessman whose interests were primarily concerned promoting transatlantic cables. 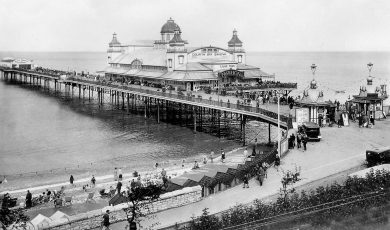 He intended to develop a seaside resort to attract the affluent classes of Manchester and Liverpool. The mansion itself was leased by John Pender to his agent John Porter, who converted it into a hotel in 1866. At that time the route from the hotel to the station wouldn’t have passed a single building. John Porter subsequently bought the property’s freehold when John Pender sold the estate in 1875. 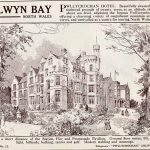 In 1887 a new wing was added in the Scottish baronial style designed by the principal architects of Colwyn Bay’s development, Booth, Chadwick and Porter, Porter being the son of the Hotel’s owner. Many important visitors stayed at the hotel, perhaps the most famous being David Lloyd George who visited during the First World War when he was Prime Minister. 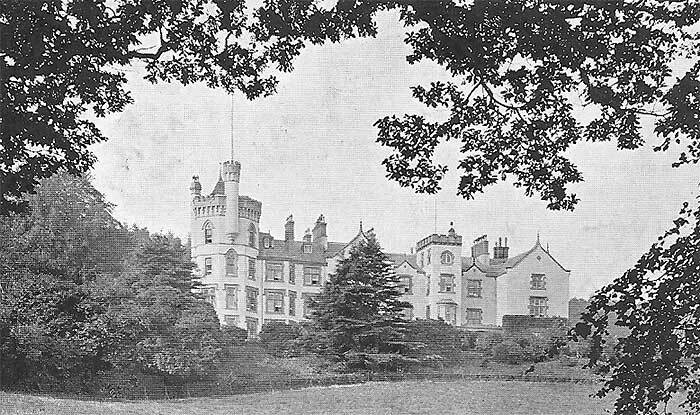 The property remained in the Porter family until 1938 when it was sold as an addition to Rydal School. During World War 2 it was one of many buildings in Colwyn Bay taken over by the Ministry of Food and was one of the buildings used to provide a staff canteen. When the Ministry vacated the building it reverted to its use as a school and since then has been used as the junior or preparatory school for Rydal School – now Rydal Penrhos. Whilst over the years the building has been much altered and extended, many of the internal details of the hotel remain. 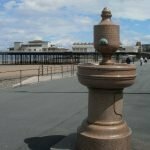 Along with the external features and the place of the building in the history of Colwyn Bay these are important in justifying its protection as a Grade II Listed Building.